The Millennium Oceanography Institute (Instituto Milenio de Oceanografía, or IMO), with the aim of bringing science to all, performs various activities within its area of reach. The challenge is not minor: to encourage students of different levels (preschool, elementary, and secondary education) with topics related to marine sciences. So far in 2016, IMO has reached out to students through its “IMO in School” programs. Around 9 a.m. on Thursday, April 28, we headed to San Juan Bautista School of Hualqui. This town is located about 38 minutes from Concepción, in the Biobio region of Chile. Dr. Alejandro Murillo from IMO prepared a “Microbial World” program with the objective of demonstrating the great diversity of areas in which microbiology has changed the quality of life of human beings. “One goal was to change the concept that all microorganisms are pathogens or harmful to humans, since that is an outdated perception, derived from clinical microbiology and the study of pathogens that affect our species. However, there are millions of other microbial species in the environment and in our own bodies that are beneficial and essential for life on the planet as we know it today, “said Murillo. Working with humanities students, the challenge was to generate interest. The goal was accomplished—at the end, students in this course could interact with samples of microbes that Dr. Murillo prepared. May is the Month of the Sea, an ideal time to raise awareness in the future of our country: the students. 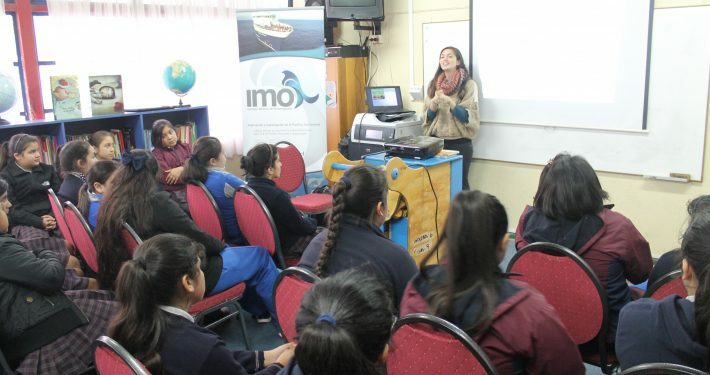 On the morning of May 12, IMO visited two schools in Talcahuano, located about 17 minutes from Concepción. The Liceo A21 and the Colegio Cruz Del Sur had the opportunity to enjoy two programs: “The Route of Waste,” led by chemist Macarena Troncoso, and “Ocean and Climate,” under the direction of marine biologist Evelyn Bustos. The experience was remarkable. Troncoso shared her talk with 12- and 13-year-old children, who were very curious and engaged in the activity. “Given the importance of the pollution issue, it was possible to engage the children through their own experiences—waste reduction, recycling paperboard and plastic, reuse of organic waste in organic gardens, and observing pollution of rivers and beaches of the Biobio Region,” she said. On June 2, the IMO with INCAR (Interdisciplinary Center for Aquaculture Research) visited the Concepcion College, headquartered in San Pedro, a commune about 11 minutes away from Concepción. The task was not easy—how could we introduce concepts of oceanography to kindergartners and preschoolers, considering that they are only 4 to 5 years old? However, the IMO and INCAR were ready to fulfill the goal. Barbara Léniz, assistant director of the Extension Team from IMO used a series of drawings, “The Adventures of Ruka.” In the series, a child explores the depths of the Pacific Ocean through a magical seashell. The kids enjoyed three chapters, then moved into doing hands-on experiments. The INCAR team brought a diving suit, so the students could interact in a direct way with the experts. At that age, it’s best to learn through doing, and, apparently, creating change and exploring oceanographic culture is important at that age: “The only way to create changes in society is through children. The idea is to show them the experience under the sea and the way we work as marine biologists in the diving activity. Perhaps in the future, some of the children who participated in this activity can become interested in this area. I was impressed with the attention span of the kids,” said Jaime Gutierrez, a member of Team INCAR Extension. 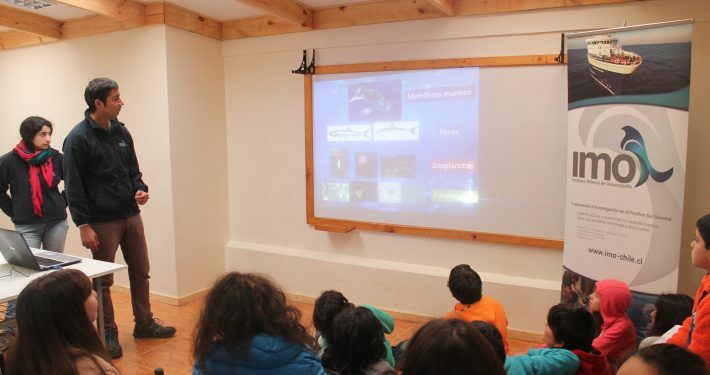 Forty students, ages 10–11, were able to experience and discover the diversity of algae and animals that inhabit the coastal area, ocean, and deep zone present in Chile. It seems the experience of teaching new generations is beneficial to the students, teachers, and scientists. Students learn concepts that are not often explored in depth in the classroom. Teachers are able to learn about fresh and updated scientific knowledge. Finally, scientists can absorb the enthusiasm and motivation of students. Definitely, science is for everyone!